It was predictable. 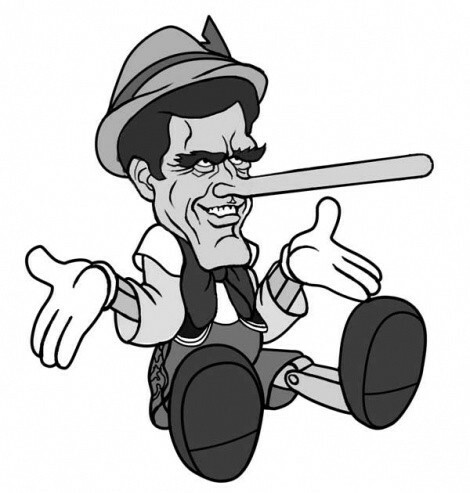 No sooner had candidate Romney fibbed about his name—everyone knows his first name is actually Willard—than everyone pounced on my former missionary companion and brayed throughout the blogosphere about Mit’s incorrigible lying, his consistent flip-floppery and his intransigent phoniness. I have to say, my heart sank below to a spot just east of my spleen when I heard Mit come forth with his latest breathtaking whopper on national TV. Sure, it was—in the cut-the-guy-some-slack department—an attempt, albeit lame, to crack a joke. No one laughed, but no one ever laughs at Mit’s jokes, especially when he barks out a tinny ha-ha-ha at his own tone-deaf humor. All of us here at Team Mit (he downsized his middle name a year ago, a demonstration that he was as much a tightwad with his name as he was with his purse) have told him repeatedly to play it straight, but Mit just can’t help letting his inner comedian out. It could be that the clownery surrounding him at the Republican presidential debates is contagious. More probably, in the stress of the moment, Mit regresses to his goofball prep-school persona, in which role he annoyed classmates with wedgies, fake vomit and whoopee cushions. Whatever the case, I want to take this opportunity to stand up for my old missionary companion and suggest another way of looking at Mit’s propensity to play fast and loose with the truth, whether it takes the form of outright deception, such as the campaign commercial in which a statement by president Obama is edited to say the exact opposite, or harmless flip-floppery, such as constantly mutating positions on abortion, immigration, gay marriage or why he tied his dog Seamus to the top of his station wagon on a 12-hour family trip across the windy wastes of Canada. Here’s my case for my close friend Mit: His flip-floppery, weasely waffling and “misstatements” represent the very best of what followers of pragmatic philosopher William James called the “chameleon principle.” I witnessed the CP up close and personal during the two and a half years I spent with Elder Romney as emissaries of the Lord Jesus Christ in Paris, France. It was a marvelous work and a wonder to see him engage with the skeptics and cynics as we strolled through the Tuileries or pounded the pavements of the Champs Elysees. “Whatever works, Elder Deep End,” Mit used to say. Time after time, Elder Romney had an uncanny knack for sensing what his audience wanted to hear. Mit has always been very attuned to details, and even the smallest detail was subject to a cognitive massage. A good example of this was how Elder Romney played fast and loose with his name in the service of what he called the Higher Expedience. “Je suis Pierre,” he would say to the newest investigator in his impeccable French. “I am Pierre.” People really warmed up to him when he gave himself a French name. Later, back in our tiny garret in the Rue de la Monsieur Prince, in the vicinity of Les Jardin de Luxembourg, when I challenged him on the ethics of calling himself Pierre (or Claude or Jacques or Napoleon), he would expound knowledgeably on the ontology of names, citing Wittgenstein’s seminal treatise, “Names and Nonsense” (in the original German, “Namen und Unsinn”). Mit was equally flexible, name-wise, when we vacationed in Salzburg, where the two Austrian sisters we hooked up with knew him only by the name of “Wolfgang.” So you can see that what most observers regard as expediency and weasely waffling is, in truth, principled pragmatism. To give Mit credit, his adventures in flip-floppery are nothing new. In fact, if he wanted to, Mit could claim that his first name is, in fact, Mit, not Willard, since he was originally christened Mitt Willard, and has, over the years, flipped and flopped back to Willard Mit, depending.